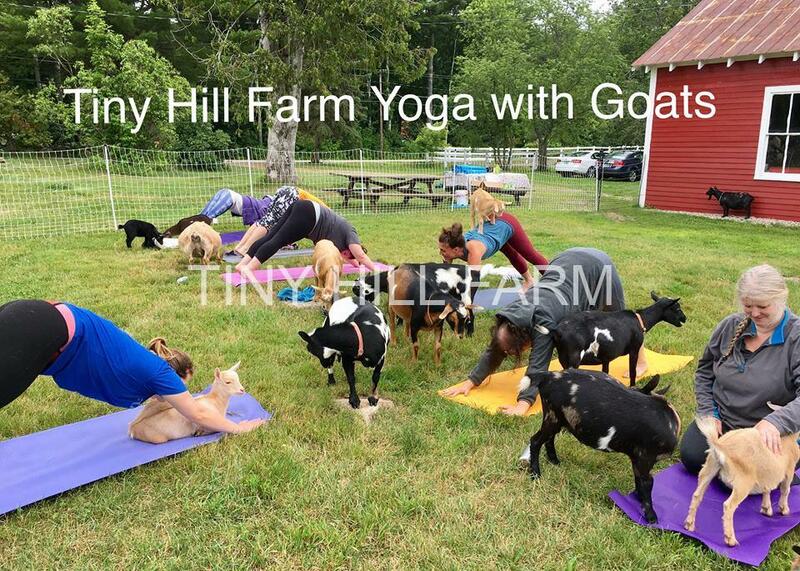 We are very excited to announce that Tiny Hill Farm will be hosting “Yoga with Goats” classes again here on our farm in Milton Mills, NH! Join us at our beautiful farm for an hour of fun, relaxation, and goats! 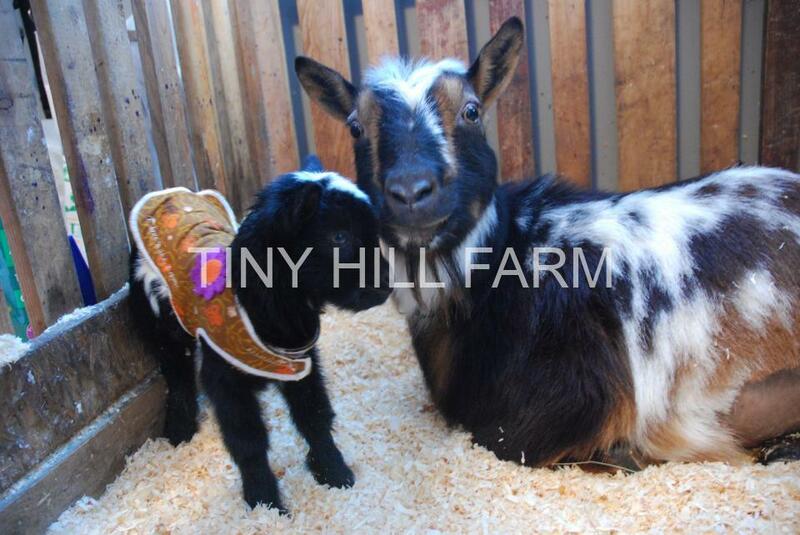 Our large herd of playful Nigerian dwarf moms and babies will be joining us outdoors on our peaceful 5 acre field. 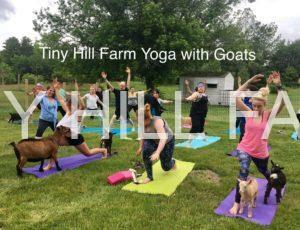 No yoga experience is necessary, but a love of adorable goats is mandatory! Check out all the details here. 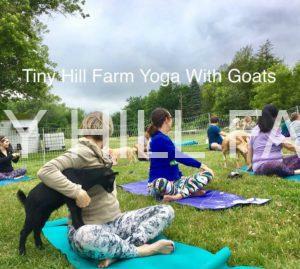 Posted in Uncategorized	| Comments Off on Yoga with Goats is BACK! Happy February! Just wanted to post a quick farm update welcoming two awesome bucks to our herd and giving an update to our kid reservation list. 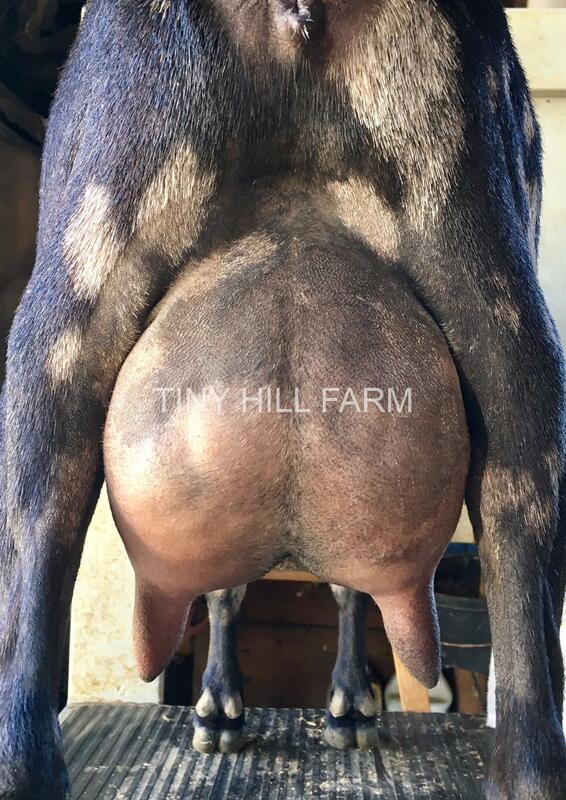 Tiny Hill Farm Dude of Thrones *B (TinyHillFarm’s Karl Hungus*B X Tiny Hill Farm Sansa 1*M) has come back home and he’s brought his friend Fairlea Mookie Betts *B (Fairlea Edmond Dantes *S *B X Fairlea Irene 6*D 6*M) along with him. A big thank you to our friends at On Golden Farm for entrusting us with these two gentlemen. Looking forward to adding their stellar genetics to our herd! You can see more information about these bucks on our Herd Book and Kidding Schedule page. We are now running a wait list for doe and doeling reservations. Although we have stopped taking deposits for does and doelings, we are still running a wait list in case we have any additional available females. Not looking for a doeling? Our buckling and wether reservation lists are still open! If you are looking for a fantastic herd sire or just an adorable pet we still have reservations available for you. Contact us for details. New kids are due to start arriving in March! Happy spring! We are excited to announce that two more of our goats have earned ADGA Superior Genetics awards. Congratulations to SG Tiny Hill Farm Aurum 4*M and SG Tiny Hill Farm Penta 6*M! Penta and Aurum also earned their milk stars this year, both as one year old first fresheners. Here’s a photo of Penta’s rear udder. We think she’s pretty awesome. If you are wondering about their funny names, both does are named after geysers in Yellowstone National Park. Season’s Greetings from Tiny Hill Farm! Wondering if we offer baby goats for sale as Christmas presents? No way! Giving an animal as a surprise gift is a terrible idea! 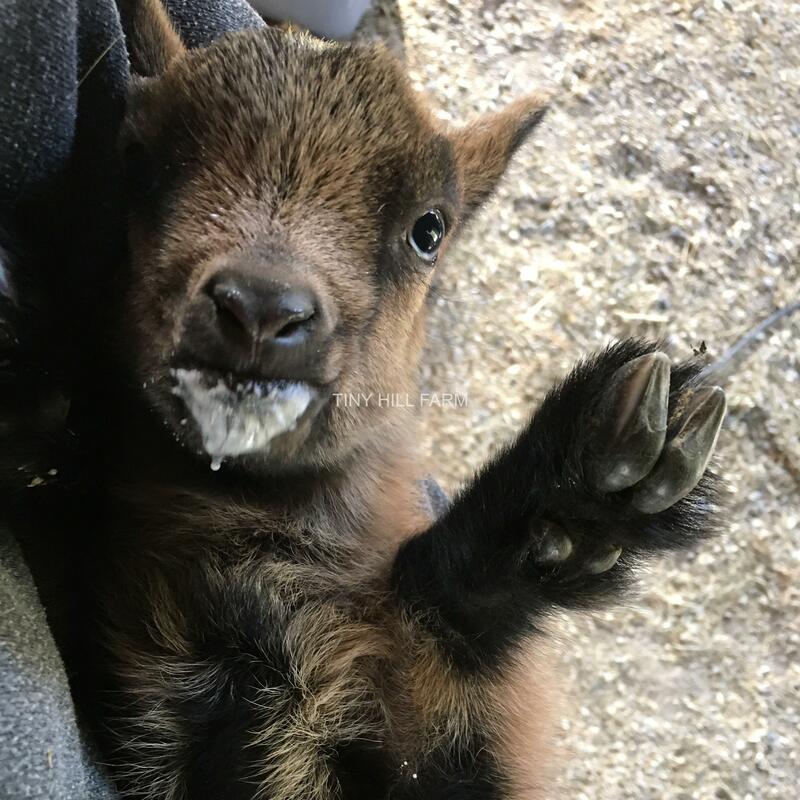 However, we do have several spots left on our reservation list for spring 2018 kids if you want to give yourself or a friend the gift of a spectacular goat kid or kids this spring! Pictured here is Tiny Hill Farm Aurum 4*M and one of her doelings from this spring. Aurum was bred this month to MCH Kids Corral LL Smokey Fire via AI. We are excited for this pairing and we can’t wait to meet those kids when they arrive in March. A very limited number of reservations for this breeding are still available. If you prefer to DIY your baby goats we are still offering driveway breeding services to approved does on a limited basis. Scroll down to read more and feel free to contact us with any questions. Happy holidays! It’s that time of year again- breeding season! This year we are offering limited driveway breeding services to approved does. We have three adult bucks to pick from, all three are proven, quality bucks with impressive pedigrees. Please check out our herd page for pictures. If you are looking for increased milk production, our Linus (Sugar Moon V High Roller *B) is a buck to consider. Linus was ranked as the #1 Nigerian in ADGA’s 2015 Young Sire Development Program. His dam 3*M SG NC Promisedland SIA Zena 6*D AR2263 VEEE90 is a 99th percentile elite doe. His sire Sugar Moon Viva Las Vegas*B is also an elite buck. Linus appraised at VVV87 as a two year old. His full sister is ADGA Elite doe SG Sugar Moon V Zuzanna 3*M 6*D. Linus has consistently produced daughters who milk over 1,000lbs as first fresheners. He measures 23 inches tall at the withers. If dairy characteristics and conformation important to you, a buck to consider is our PeeWee (SG+ B Old Mountain Farm Stag VEE X Old Mountain Farm Wirosa) PeeWee’s sire is the grandsire of the 2017 ADGA National Show Grand Champion. His granddam is the great grandam to the Reserve Grand Champion. His 1/2 brother sold for $10,400 at the 2017 ADGA Spotlight Sale. PeeWee has consistently produced long, level, and stunningly beautiful and correct kids. PeeWee is available for sale. For breeding for production, conformation, longevity, and a little bit of pizzazz, our homegrown Karl is a nice option. Karl is sired by our Linus. His dam,1*M AR Kids Corral LB Krystal Blue * AR 2307 VEEE90 earned her linear appraisal score of 90 as a 10 year old 10th freshener. She also was predicted to produce 1,219lbs of milk as a 10th freshener. Not too bad for a goat senior citizen! Karl has blue eyes and moonspots, so not only does he produce high quality kids with lots of potential, they often come with some extra “bling”. Our bucks are available only for driveway breeding services to approved Nigerian dwarf does. We require negative CL and CAE testing from within 2 months. Does must be ADGA registered with no disqualifying faults and free of external parasites. We issue service memos the day of service. Novice breeders will receive doe only service memos. As of 2018, we charge $150 per breeding for new clients, with one free rebreeding if a doe does not settle, however we do not offer refunds (including if the doe is not in standing heat). Please contact us for details and a copy of our contract. Thank you! We have updated our goat Herd Book and Kidding Schedule for the 2017-2018 breeding and kidding season. 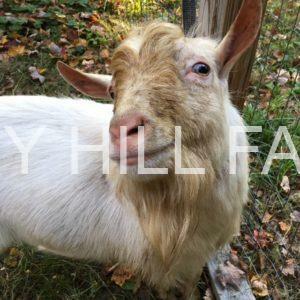 Take a peek at the page to see an updated list of all of our goats and their accomplishments, plus planned breedings, and kid reservation availability. 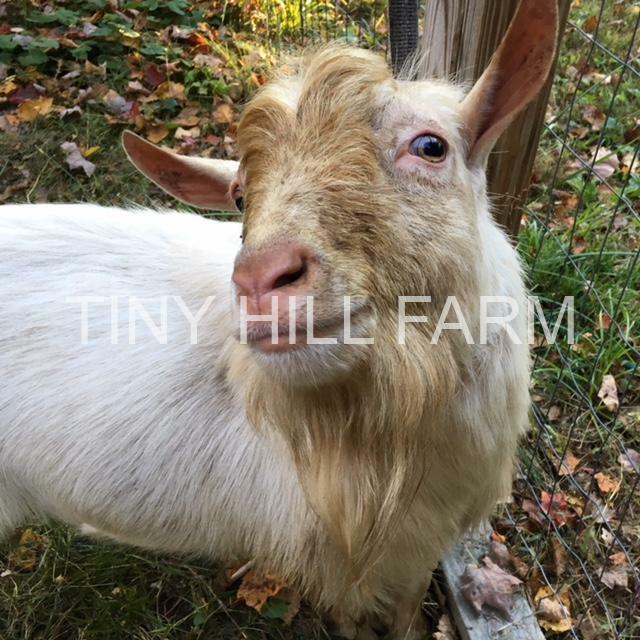 If you might be interested in adding a Tiny Hill Farm Nigerian dwarf goat into your life, now is the time to contact us with any questions and to get on our kid reservation list. We look forward to hearing from you! We are very proud to announce that two of our homebred does made ADGA’s August 2017 Elite Doe list. Both are ranked in the 98th percentile. Those two does are sisters, SG TinyHillFarm Super Lois 6*M and Tiny Hill Farm Penta. Lois is a two year old second freshener, and Penta is a yearling first freshener. Welcome! We have lots happening on the farm right now. 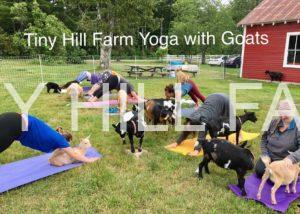 We just finished our last Yoga with Goats classes for the season. We’ll start classes again in the spring. In the meantime we are still booking private classes, and we still have merchandise available for sale. 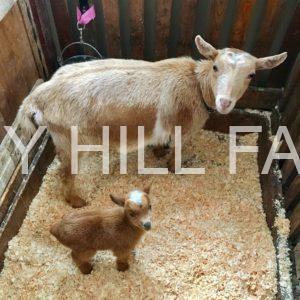 We have several goats available for sale, including two adorable doelings (SOLD), two wonderful adult bucks (one is SOLD), and an awesome milker with a fantastic pedigree. Check out our herdbook and kidding schedule page for more information. Looking for beautiful chickens? We have many sexed juvenile birds available. The breeds we raise are New Hampshire bantams, mille fleur d’Uccle bantams, and silkie bantams. New Hampshire and mille fleur pullets are $20 each. Silkie pullets are $45 (SILKIE FEMALES AND MILLES SOLD OUT). Cockerels are free with the purchase of a female. Our birds are from show lines and are NPIP tested. Contact us for details. We also have goat milk and eggs available for sale! Call or text to check availability. Thanks for reading! New Yoga with goats class added in August! Contact us with any questions, if you would like any merchandise, or if you would like to sign up for any classes. 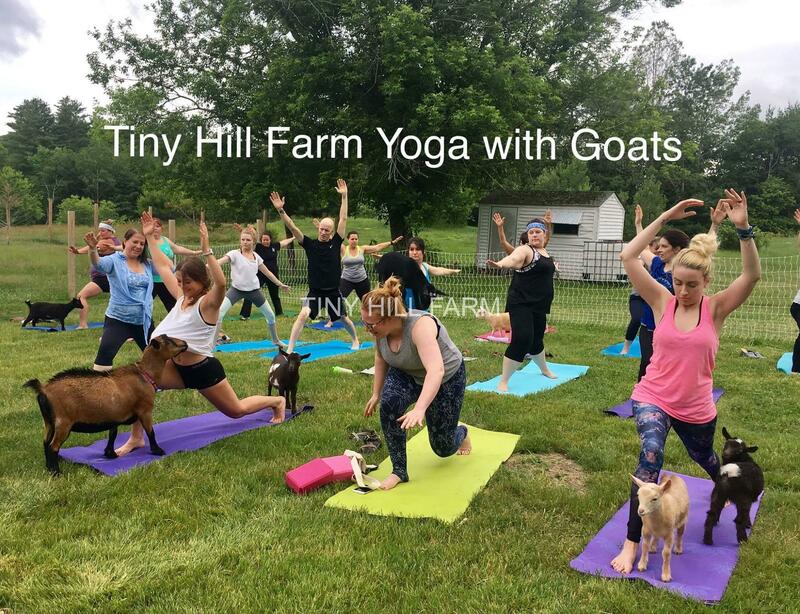 No yoga experience is necessary, but a love of adorable goats is mandatory! Classes last one hour and are $20 per person. Our children’s class is 1/2 an hour and is $20 per child. Please contact us by calling/texting (603)817-0081 or email tiny hill farm (at) gmail.com to register or with any questions. We also have tank tops, tee shirts, yoga pants, and yoga mats available for sale. Everything is $20 and shipping is FREE! Namaaaaste! We also still have several young standard size pullets (pullets are young hens) ready to go to their new flocks. The breeds we have available are white crested black Polish, Dominiques, Barred Rocks, buff Cochins, and light Brahmas. All are out on pasture and should be laying in just a month or two. They are $20 each. We also have a few males available for no charge with the purchase of a female. Our flock is NPIP certified. We also have a few Nigerian dwarf dairy goats available for sale. Please contact us for details. Thank you for reading! 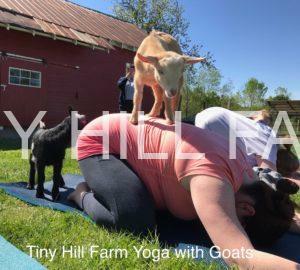 Posted in Uncategorized	| Comments Off on New Yoga with goats class added in August! Here’s a quick farm update about yoga classes and chickens we have available for sale. We still have some spots left for our Friday July 14th at 6pm Yoga with Goats class and our Saturday July 15th class at 9am. That’s this Friday and Saturday. We would love to have you join us! A question we get often is, “Do I have to do yoga during class?”. The answer is no, you are more than welcome to just hang out with the goats and enjoy our beautiful farm without doing any yoga. We also have several young standard size pullets (pullets are young hens) ready to go to their new flocks. The breeds we have available are white crested black Polish, Dominiques, Barred Rocks, buff Cochins, and light Brahmas. All are out on pasture and should be laying in just a month or two. They are $20 each. We also have a few males available for no charge with the purchase of a female. Our flock is NPIP certified. Please contact us for details. Thank you!